… is something I hear a lot about and have tried to do myself at the beginning of a new idea. On occasion it has worked wonders and the ideas have flowed out of the connective tissue that I have created between the words, and others time it just looks like a complicated over-tangled mess. I think the problem with this is I have never really been taught to use this as a productive part of the thinking process. So many people swear by it and I know I should be able to grasp its basics. I envision it like a more complicated game of connections, where you say a word and your opponent replies with the first word they ‘connect’ to the word you have just said. I then try to connect the individual words to each other to try and identify a pattern of sorts. Often the problem seems to be there are too many connections and it becomes an impenetrable mass of language. The second problem is that when I mind map and then leave it or a while, all the ideas it created initially seem to have been erased in the elapsed time. The map itself isn’t stable enough to trigger the ideas it created in the first instance … although this can also be a positive thing as it can trigger better ideas maybe? In a way this blog today has become a linear mind map about the pros and cons of mind mapping. Or is the term ‘linear mind map’ oxymoronic? So my day’s dilemma is – if I spend a day training myself to mind map would it be a day well spent or 24 hours I’ll never get back? Mind Map, Mind Flap or Mind Flop? 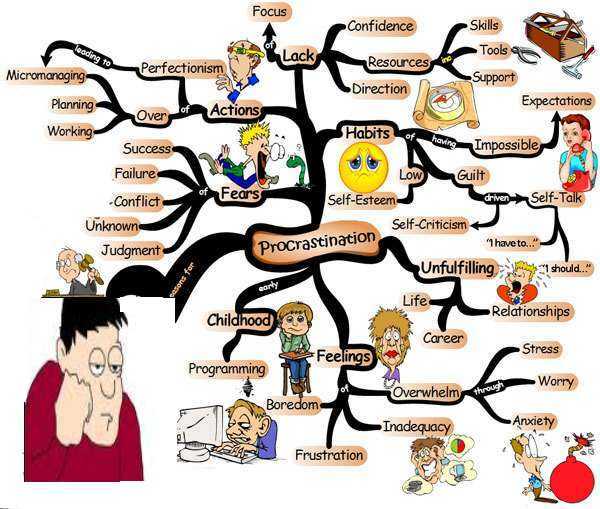 Is mind mapping just another form of procrastination? I am trialling IMindMap by Think Buzzan.com – I shall post my results on Thursday. I’ve had some success with mind maps, but your post struck a chord. I do mind map but often feel that I don’t have the confidence to replace the notes with mind maps. I’m interested to hear what you report back on the IMindMap (not heard of that one). The bottom line is using what works, some of us are more visual learners than others. I think you need to ask what are you most comfortable with – a table of stats or a graph/pie chart for example. Keep us posted on how things go. I use my own form of mindmapping – my white board and the camera on my iPhone to record progress. Because I think visually, I love mindmaps, but I’m too impatient and reactionary to allow software to ‘help’ me with the process. This way I can change from a mindmap to a list to a matrix without any computer telling me that I can’t do it! I agree with maturestudenthanginginthere – it’s what works for each of us. But, from my own experience, being aware of your learning style is the most important. I found, with some surprise, a couple of years ago, that my preferred style is visual. I was amazed, but coming to terms with this made the world of difference to me. I have often found myself with the same problem. The magic of the moment seems lost after a while and all that is left is a map. What I also have found is that mindmapping does not produce the magic of writing something where one word leads to another. It should aid me in getting the creative flow out faster. But I often find that writing in itself IS actually an integrated part of the creative process. This doesn’t mean that I haven’t found mindmaps useful. I use them for complex matters and for reviewing previously learned topics.